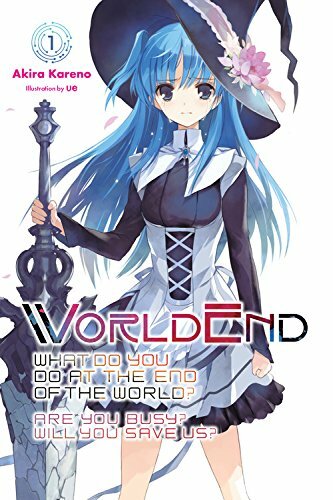 This review is for the first volume of WorldEnd – What Do You Do at the End of the World? Are You Busy? Will You Save Us?. It was written by Akira Kareno and features illustrations by ue. Volume 2 will release in English on November 13, 2018. The series is completed in Japan with five volumes, plus a bonus EX volume. A sequel series is currently releasing there, so far with six volumes. About a year ago an anime based on a light novel series was airing, and it seemed a lot of the online anime communities were talking about it, giving it high praise. That series was WorldEnd–or SukaSuka, for the Japanese shorthand. I ended up watching the anime at some point, and overall I thought it was okay. There were some good ideas there at least, and when it was eventually announced that the light novels were being licensed for English release, I figured I could give the first volume a try. I’m glad I did, because I feel like I enjoyed the book quite a bit more. WorldEnd takes place in a fantasy world, but not the exact sort of fantasy world you’re perhaps used to in many other light novels. In this story, the humans, elves, dragons, and whatnot have been wiped out by seventeen great monsters, and 500 years later the remaining species (primarily a variety of beast-peoples) live on floating islands overlooking the destroyed world below. Their armed forces employ a number of young fairy women called leprechauns, who are the only ones capable of wielding ancient weapons to fend off the still-roaming seventeen monsters. The novel takes a bit of a fairy tale approach to explaining how this world operates. Our protagonist, a young man named Willem, is actually a human hero from 500 years ago, but was injured and turned to stone during one of his great battles. He’s alive again now, and early in the story he is employed by the armed forces to work as a sort of caretaker for the fairies, most of whom are still children. The oldest of the fairies is a girl named Chtholly, who is preparing for a battle in which she must anticipate the likelihood of utilizing a self-destructive attack to defeat one of the giant monsters. As you can guess from all this, the tone of this series is different from most light novel fantasy adventures, or fantasy adventures in general. For Willem, the question he repeatedly asks himself is “Who am I?” He is not only a fish out of water in this story, but also a fallen hero who has failed and lost everyone he ever knew. This is a setup I haven’t really seen explored much in a story before, and getting it told from his viewpoint–with all his thoughts regarding each situation he finds himself in–really gives his character a level of depth that the anime was only able to hint at in comparison. Meanwhile for Chtholly, she has to face the somber reality of her very existence as a living weapon fighting for a ruinous world. The story gives us her viewpoint for certain scenes as well, and does a great job showing that tangle of thoughts and emotions she has to gradually parse through. But speaking of these two characters, I have to also give the author credit for handling their relationship in a way that felt both unique for the genre and authentic when considering their ages, backgrounds, personalities, and understandings of one another. It’s another aspect to this book that shows how much thought was put into its story–a story that puts much more focus on what the characters are going through internally, rather than on the conflicts they face externally. I admit I wasn’t expecting to enjoy this book as much as I did. It has a few rough moments (a bit more “telling” instead of “showing” than I would have liked), but all in all it’s a solid read that starts promising and ends powerfully. I’m looking forward to reading the rest of this series now, and I’ll suggest it to anyone interested in a more pensive take on the fantasy adventure genre.